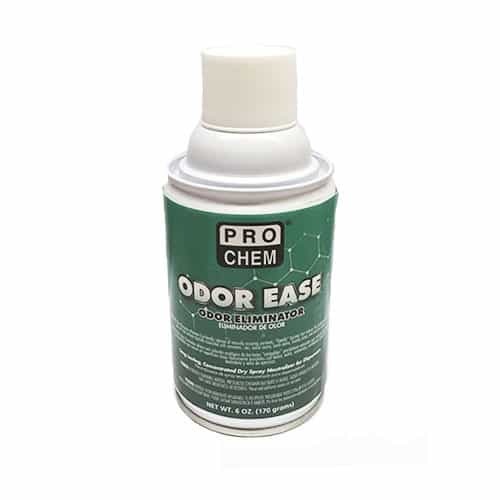 ODOR EASE | Pro Chem, Inc. ODOR EASE contains a unique blend of probiotic microorganisms that eliminate odors and maintains odor-eliminating effects on surfaces long after they are cleaned. It penetrates surfaces to the microscopic level and leaves a positive microclimate in the room that provides long-lasting protection. Programmable dispensing allows for maximum cost control. Use with ODOR EASE DISPENSER #4230 (formerly known as AIRMATIC SANI-MIST DISPENSER). Remove protective cap and insert into ODOR EASE DISPENSER. Place can in an area where spray mist makes direct contact with hard surface. *Product effectiveness begins with hard surface contact of malodors.